Hold down the SHIFT key and Drag the mouse to zoom in to an area. Click and Drag to your mouse across the map to pan. Follow instructions under "How to navigate the map" to select a Point of Interest. 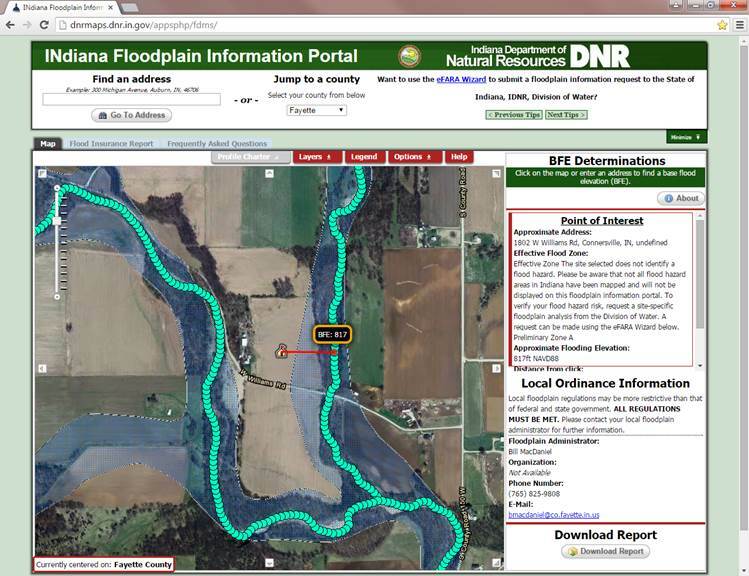 The Indiana Floodplain Information Portal, INFIP, is a mapping application that provides floodplain information for waterways to help citizens determine flood risk in an effort to minimize flood damage. 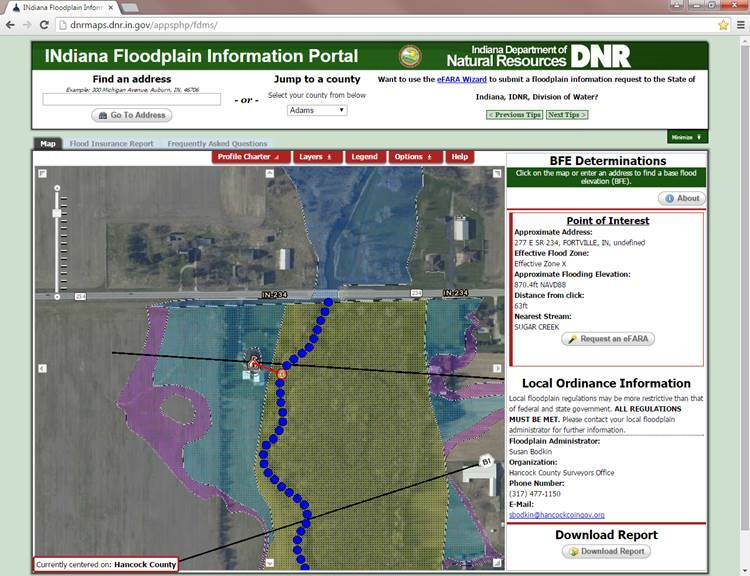 INFIP utilizes FEMA published floodplain data and floodplain data from various, IDNR approved resources in order to provide the most available, comprehensive coverage of floodplain information for the State of Indiana. Furthermore when floodplain information is not available for a Point of Interest, the Division of Water will provide a Floodplain Analysis / Regulatory Assessment (FARA) free of charge upon request. The eFARA Wizard saves you time and money by eliminating the need for you to complete a paper request that must be mailed to the Division of Water in Indianapolis. By using the eFARA Wizard, your information is directly logged in the Division of Water's database. In addition, the eFARA Wizard allows you to attach copies of documents such as legal descriptions, drawings, etc. that are helpful in completing the floodplain analysis more quickly. When floodplain data is available on INFIP at your point of interest, the Division can issue you a response more quickly. If floodplain data is not available on INFIP at your Point of Interest, the Division's response time will depend on the data resources available in our office. Find an Address tool: If using the address finder, please be aware that statewide address data layer information that is being used in the "Find an Address" tool may not correctly identify the exact location of your Point of Interest. Therefore, we recommend that if you use "Find an Address" tool to zoom to your Point of Interest on this Aerial map (Bird's Eye View) you may want to use other displayed features on the map to ensure that house icon is on the correct Point of Interest. To do so we suggest that you verify the correct Point of Interest by looking for a neighboring pond or a swimming pool, or by counting the number of houses or driveways between your Point of Interest and the closest intersection. Jump to County tool: If using the county jump, or zoom tools, click on the map to select your Point of Interest. You must zoom in to the map until INFIP prompts you to select Point of Interest. Turn Layers On/Off: To turn different Layers on and off, click the Layers tab. Click the button next to the appropriate layer to toggle On or Off. Some features and layers, such as Digital Cross Sections, are available only as you zoom in to a particular area. If the On or Off is greyed-out on a layer, zoom closer to activate the layer. click on the map then use the + key on your keyboard to zoom in or the - key to zoom out. hold down the SHIFT key on your keyboard and click the desired location on the map. Using the eFARA Wizard is easy way of requesting a formal Floodplain Analysis and Regulatory Assessment (FARA) for a specific Point of Interest. A FARA provides floodplain information and the Base Flood Elevation (BFE) for a site-specific location. In order to enable the eFARA wizard, you must select a Point of Interest. Refer to "Click to learn how to navigate the map" for additional instructions on how to get to and select a Point of Interest. After selecting a Point of Interest, simply click the "eFARA Wizard" and scroll through the 4 screens to answer a few general questions about your name, mailing address, etc. then on the 5th screen, click "Submit". The eFARA will electronically submit the information that you entered along with the Point of Interest that you selected to IDNR, Division of Water. Please be aware that statewide address data layer information that is being used by the "Find an Address" tool may not correctly identify the exact location of your Point of Interest. Therefore, we recommend that if you use "Find an Address" tool to zoom to your Point of Interest on this Aerial map (Bird's Eye View) you may want to use other displayed features on the map to ensure that house icon is placed on the correct Point of Interest. To do so we suggest that you verify the correct Point of Interest by looking for a neighboring pond or a swimming pool, or by counting the number of houses or driveways between your Point of Interest and the closest intersection. Flood insurance determinations that are required by a mortgage lender. Supporting documentation for an elevation certificate and Letter of Map Amendment (LOMA). State permitting requirements for construction in a floodway (construction examples: building, fill, development, excavation, land regrading, pond, stream crossing, bridge, culvert, bank protection, fences). Elevation and permitting requirements for the construction or reconstruction of a house or placement of a manufactured home in a floodplain. The Special Flood Hazard Area (SFHA), which is any flood zone that begins with the letter A, is subject to the 1% annual chance flood. Land in the SFHA is considered to have a high flood risk. Land outside the SFHA is considered to have a low to moderate flood risk. The Base Flood Elevation (BFE) is the elevation that the floodwaters would reach during the 1% annual chance flood event, also called the Base Flood. The Base Flood is the flood that has a one percent (1%) chance of being equaled or exceeded in any given year. The BFE is determined by identifying the ground elevation that the floodwaters rise to at a given point during a Base Flood event. In addition, by analyzing various variables using a complex hydrological computer model, the BFE can be predicted. Once a BFE has been established, flood "plains" or more commonly call flood "zones" can be mapped in relation to the earth's surface. The BFE can also be referred to as the 1% annual chance flood elevation, Regulatory Flood Elevation (RFE), or the 100-year frequency flood elevation (100-year flood). Base Flood Elevations (BFE) are used by federal, state, and local agencies to regulate areas subject to flooding. To find out more about floodplains, flood insurance, and state floodplain regulations, click on the FAQ tab. Cross Section lines that display in Zone AE denotes that the water surface elevation will be the same all along the line. The mandatory purchase of flood insurance is required as a condition of a federally backed mortgage on buildings located in the FEMA identified Special Flood Hazard Area (SFHA) identified on Flood Insurance Rate Maps. To get started with finding out if your property is located in a SFHA, either enter an address above or zoom in and click on your property. Please note: in addition to complying with federal and state floodplain regulations, you must also comply with local community's floodplain ordinance requirements. Local floodplain regulations may be more restrictive than that of federal and state government. ALL REGULATIONS MUST BE MET. Please contact your local floodplain administrator for further information. Local floodplain regulations may be more restrictive than that of federal and state government. ALL REGULATIONS MUST BE MET. Please contact your local floodplain administrator for further information. To generate a report, please zoom in and select a point of interest on the map by clicking on a location. It may take several seconds for the document to appear when you click the view button. The space to the right will be gray until it is fully loaded. Larger documents will take longer to load. Data sources provided in INFIP and their use are described below. The data layer "Effective Special Flood Hazard Area" ("Effective"), is the National Flood Hazard Layer (NFHL) as published by FEMA. The NFHL data is a digital representation of the former paper Flood Insurance Rate Maps (FIRMs) for counties that have completed the Map Modernization Initiative. The data is derived from official FEMA digital products in the form of Digital Flood Insurance Rate Maps (DFIRMs) and Letters of Map Revision, and represents official FEMA designations of the Special Flood Hazard Areas. This data can be used for official National Flood Insurance Program (NFIP) purposes in accordance with the FEMA Mitigation Directorate Policy document tiled "Use of Digital Flood Hazard Data" dated November 29, 2007. For the non-modernized counties, the Effective is enhanced by the addition of the floodplain data from digitized paper copies of the FIRMs and the information should be considered advisory only. For these non-modernized counties, the paper maps are the official FEMA documents for regulatory and insurance purposes. Once the NFHL is official, the Effective is updated with the newly published information. For the status of counties published by FEMA please see http://www.floodmaps.fema.gov/NFHL/status.shtml. The data layer "Preliminary Special Flood Hazard Area" ("Preliminary") is a proposed digital product (DFIRM) presented by FEMA for acceptance and approval by the county as an official DFIRM for that particular county. This Preliminary flood hazard information is for outreach, advisory and review purposes only, and is subject to revision. It should not be used for regulation, enforcement, insurance rating purposes, or for mandatory flood insurance purchase requirements. The data layer "Best Available Flood Hazard Area" ("Best Available") is the Effective with additional studies that have been reviewed and approved by the Division of Water. While this data has not yet been submitted to FEMA for inclusion in the FIRMs or NFHL (DFIRMs), this data can be used for general planning, construction, and development purposes. However, Best Available cannot be used for flood insurance determinations. The majority of local jurisdictions have options for using best available data; however typically only the FEMA floodplain limits have been adopted into the local floodplain ordinance. The floodplain data shown in the Best Available layer is generally more recent than the official FEMA NHFL data in the Effective layer. However, while the Best Available layer has been approved by the Division of Water, this data not gone through the due process standards FEMA requires for publication in the NFHL. Where a floodway analysis has been completed, an "Approximate Floodway" is included in the Best Available layer. These floodways are based on non-detailed floodplain modeling (i. e. no bridges), but otherwise meet the guidelines for development of floodways in Indiana. These floodways are acceptable for general use in determining jurisdiction for the Indiana Flood Control Act, but should be used with caution. These floodways do not meet the requirements for publication in the FIRMs or NFHL. Which layer should I use? The following table presents a general guide to use of the effective and best available layers within INFIP for common situations. This is not intended to be a definitive guide, as every situation is unique and may require additional consideration of the appropriate information to use. Along many waterways, an Approximate Flooding Elevation is provided for selected Points of Interest. These elevations are based on Flood Elevation Points (FEPs), which are points placed on the centerline of the stream at 50 feet intervals or within lake boundaries. The FEPs are either determined from Base Flood Elevation information from FEMA's Flood Insurance Studies, or from studies done by or for the Division of Water. Please note that these elevations are provided for general information purposes only. If a Base Flood Elevation is needed for official flood insurance or construction purposes, it should come from a FEMA Flood Insurance Study or from a DNR determination. If a Flood Insurance Study exists for your site, the "Source" in the Point of Interest information will include "Zone AE". If the Source does not state Zone AE, a DNR determination would be needed and can be requested through the eFARA Wizard. There may be discrepancies with the elevations shown in INFIP and the actual elevation at a Point of Interest due to the determination methodology or a lag time in data updates (such as the issuance of Letter of Map Revision or approval of other studies). Further information about methodology discrepancies can be found on the Help tab. If other elevation discrepancies are found, please contact our office for an official determination through the eFARA Wizard. Why should I find out what the new flood risk is for my property? How can floodplain information help you? How do I get the floodplain information for a residence or tract of land? What is a base flood event? How do I know if my house or property is in a floodplain or floodway? What does it mean to me if my house or my property is in the floodplain? Why would I want to buy flood insurance on my house or other structures on my property? What factors determine flood insurance premiums? Upon request The Division of Water provides Floodplain Analysis / Regulatory Assessment (FARA) free of charge. Knowing your flood risk is the first step to flood protection. Flooding is the most frequent and costly disaster in Indiana. The risk for flooding changes over time due to erosion, land use, weather events, and other factors. The likelihood of flooding has changed along with these factors. The risk for flooding can vary within the same neighborhood and even property to property. Flooding occurs not only in high-risk areas, but also in low to moderate-risk areas. More than 25% of properties flooded nationwide were in areas designated as having a low or moderate flood risk. The National Flood Insurance Program (NFIP) requires the purchase of flood insurance on buildings with a federally backed mortgage that are located in the high-risk area (Special Flood Hazard Area/Zone A). After several historic floods in the early 1900's that resulted in millions of dollars in flood damage, Indiana leaders adopted legislation to minimize future flood losses for Indiana citizens. From that legislative initiative, a floodplain management law was enacted in 1945. The Division of Water has been charged with administrating the floodplain management law. In doing so, the Division provides technical, engineering, and educational support for floodplain management in the state. The Division is also responsible for regulating various construction activities within, over and/or under the State's waterways through a number of regulatory programs. The Flood Control Act (IC 14-28-1) regulates various development activities (e.g. structures, obstructions, deposits, and/or excavations) within the floodway of any State waterway by requiring DNR approval prior to the beginning of the project. DNR authority under the Flood Control Act is further defined in 312 IAC 10: Floodplain Management. Floodplain information can help a property owner determine their risk of flooding on their property, to help decide if flood insurance is needed for insure their residence against floodwater damage, provide necessary information to the property owner for filing a waiver on flood insurance to FEMA, or inform property owners about local and state floodplain regulations. Owning property that is located in a floodplain can cost you more each year than owning property that is not in a floodplain. These costs could include the cost of flood insurance premiums, the cost to apply for construction permits, or the cost for repairs to your home and personal property when you have flooding. Here are some examples of how floodplain information can help you make wise decisions for property that are located in floodplains. If you are thinking of buying a house, floodplain information can tell you if the house is in a flood zone. Buying a house in the floodplain may cost you more money each year in insurance premiums to pay for flood insurance and your risk of being flooded is higher. If you need to get a loan from a mortgage company to purchase a house, floodplain information can tell you if you will be required to get flood insurance coverage on the house. If you wanting to get out of paying flood insurance on a house, floodplain information is required to be submitted with the application that is mailed to FEMA for a Letter of Map Amendment. If you want to build a non-residential building, floodplain information can tell you how high you may have to elevate the building in order to get the appropriate local and/or state permits. If you are thinking of buying land to build on, floodplain information can tell you if the property is in the flood zone. Before making the decision to purchase a piece of property in the flood zone, be sure to consider that building in a floodplain may require you to get local and/or state permits. Obtaining the appropriate local and state permits can be a very lengthy and costly process. In addition, be aware that state law prohibits the construction of new homes in the floodway and requires that any construction activity in the floodway will require a permit from the DNR, Division of Water. An application with the Division of Water for a construction in a floodway permit can take 2 to 5 months for the review. See What is a floodway? below. How do I get floodplain information for a residence or tract of land? 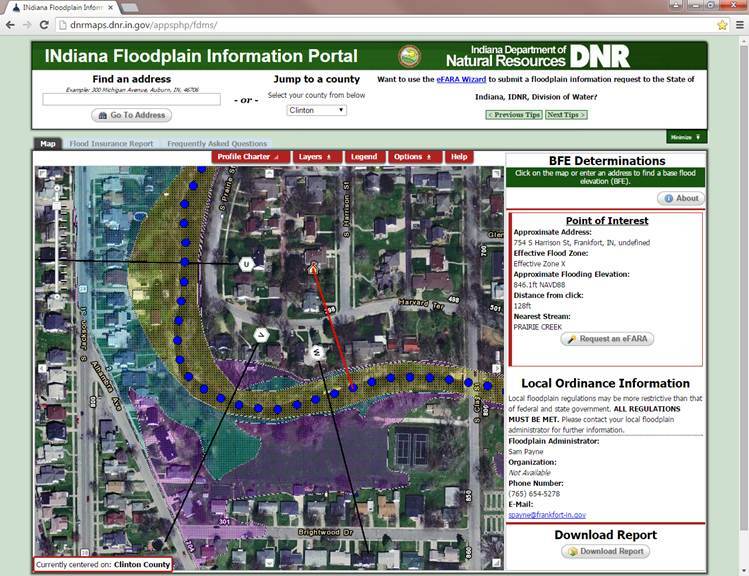 By using INFIP and the eFARA Wizard, you can request floodplain information, free of charge, from the IDNR, Division of Water. 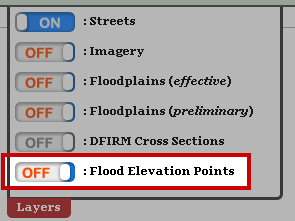 If floodplain information is available on INFIP at your site, the Division can issue a written response for your Point of Interest more quickly than if no floodplain information is available. A base flood event is referring to flood events that are of historic nature. The likelihood of the reoccurrence of historic flood events such as a base flood event is statistically calculated. Therefore one can predict that a base flood event has a 1% chance in any year that floodwaters would reach the Base Flood Elevation for that specific location. The Base Flood Elevation (BFE) is the elevation that the floodwaters reach during the 1% annual chance flood event, also called the Base Flood. The Base Flood is the flood that has a one percent (1%) chance of being equaled or exceeded in any given year. The BFE is determined by identifying the ground elevation that the floodwaters rise to at a given point during a Base Flood event. In addition, by analyzing various variables using a complex hydrological computer model, the BFE can be predicted. Once a BFE has been established, flood "plains" or more commonly call flood "zones" can be mapped in relation to the earth's surface. The BFE can also be referred to as the 1% annual chance flood elevation, Regulatory Flood Elevation (RFE), or the 100-year frequency flood elevation (100-year flood). Base Flood Elevations (BFE) are used by federal, state, and local agencies to regulate areas subject to flooding. The floodplain is the entire surface of land and channel that floodwaters inundate during a base flood event. Floodplains are made up of the floodway and the flood fringe. The floodway is the channel and the land surface where the floodwaters are rapidly flowing during a base flood event. The floodway limits along a waterway cannot be determined by just looking at a floodplain. The floodway limit of a waterway is determined through complex hydrological computer modeling using a combination of various hydrology data such as rainfall amounts, historical flood events, topography, surface conditions, and soil saturation rates. Many floodways have been determined and identified on FEMA flood maps. The DNR Division of Water regulates construction activity in the floodways through a construction permit application process. Construction that proposes development, placing fill, or excavating materials in the floodway requires prior written approval before initiating construction. Typical examples of floodway projects subject to DNR review and approval are placing fill, development, excavations, dredging, channel work, bank stabilization, bridges, stream crossings, utility line placement/repair, and residential and non-residential buildings. The fringe is the remaining portion of a floodplain that is outside the floodway. The fringe is the land surface where floodwaters spill out onto and inundate during a base flood event. The fringe areas during a base flood event are not typically floodwaters that are rapidly flowing but rather floodwaters that pool and only begin to recede as the floodway begins to lower. All waterways have a floodplain and a floodway even though some are not identified on flood maps. Some waterways have a wide floodplain and floodway while others waterways may have a narrow floodplain and floodway. Many floodplains and floodways have been identified and are shown as Zone A on the Flood Insurance Rate Map (FIRM) or Flood Insurance Study (FIS). If your community participates in the National Flood Insurance Program (NFIP), the local planning or zoning official maintains current copies of flood maps for your area. For floodplains and floodways that have not been mapped, the IDNR, Division of Water can perform a site-specific floodplain analysis. 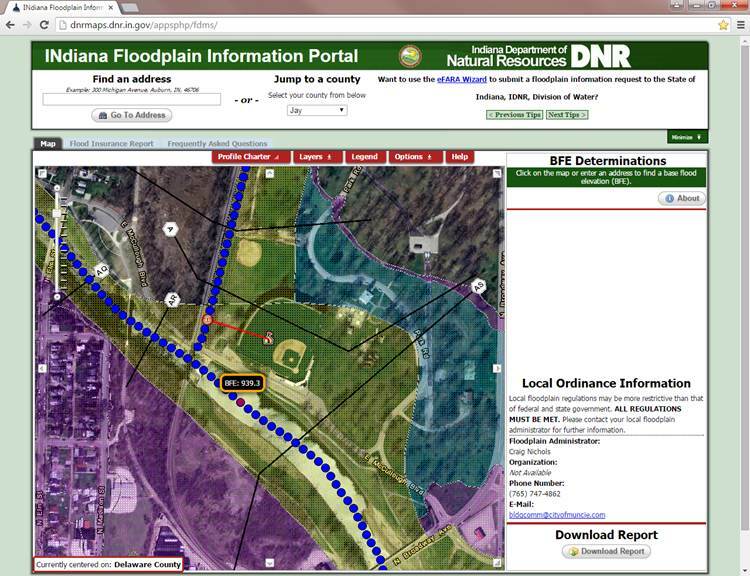 To request a site-specific floodplain analysis, a request can be made requested using INFIP and the eFARA wizard. If your residence or other buildings on your property is in the floodplain, those structures are at risk of being flooded especially during a base flood event. The degree of flood damage can vary greatly depending on the ground elevation that the buildings are built on in comparison to the Base Flood Elevation (BFE). For example, if the Base Flood Elevation is 975.2 feet, NVGD (National Vertical Geodetic Datum), at your site; and, your house is built on a ground elevation of 970.2 feet, NGVD, you can expect about 5 feet of floodwaters in your residence during a base flood event. If your house or other structures on your property is located in a floodplain, flood insurance can pay you for your losses due to floodwaters. Regular house or property insurance will not cover damages from floodwaters. Only flood insurance will reimburse you for damages caused by floodwater. If you live within a community that participates in the federal National Flood Insurance Program (NFIP), the mortgage company that you borrow money from to purchase your house is mandated by federal law to require you to obtain flood insurance as a condition the mortgage loan if you are in an identified floodplain. In addition, if you live in a community that participates in the National Flood Insurance Program and you carry flood insurance on your house or structures, you are eligible for additional federal emergency assistance if you are damaged by a base flood event. That assistance may include money for, temporary housing, food, building repairs, etc. Only about 450 communities in the state of Indiana participate in the National Flood Insurance Program. To see if the community in which you live participates in the NFIP, you can contact your local floodplain administrator or your local building permit official. Detailed information about flood insurance premium factors can be found at the FEMA Map Service Center and FloodSmart.gov links below. For a summary of changes to the National Flood Insurance Program due to the Homeowner Flood Insurance Affordability Act of 2014 (HFIAA), please see the HFIAA Fact Sheet. You may be able to apply for a Letter of Map Amendment (LOMA) or Letter of Map Amendment Out-as-Shown (LOMA-OAS) if you can prove that 1) your structure or property is on natural ground levels with an elevation higher than the Base Flood Elevation (BFE); or that 2) your structure or property is located outside of the Special Flood Hazard Area (SFHA). A LOMA is a letter from FEMA which allows a mortgage lender to waive federal flood insurance requirements by stating that an existing structure, property, or portion of a property that has not been elevated by fill is not located in the Special Flood Hazard Area. If the structure or property is located inside of the SFHA, the property owner may apply for a LOMA if it can be demonstrated that it is located on natural ground levels with an elevation higher than the BFE. Specific elevation information must be submitted with the LOMA application, typically documented by a licensed surveyor or engineer. If the structure or property is located outside of the SFHA, the property owner may apply for a LOMA-OAS. Elevation information is not required in this review process. If requesting a LOMA-OAS, please write "Out-As-Shown" at the top of the application form. Visit www.fema.gov/online-lomc to submit a LOMA application online or to obtain the LOMA application form, instructions, and Elevation Certificate form. These can also be obtained by contacting FEMA toll free at 1-877-336-2627. There is no fee for a LOMA application, although fees may be associated with hiring a surveyor to obtain the elevation information for the Elevation Certificate. An official floodplain analysis letter from the Division of Water should be obtained before you send in a LOMA request to FEMA if the BFE is not included in FEMA's Flood Insurance Study. You can use the eFARA wizard to obtain an official floodplain analysis from the Division of Water. Be aware that regardless if FEMA issues a LOMA, the mortgage lender has the final decision regarding flood insurance requirements. Sorry, the report functionality is unavailable at this zoom level. Please zoom in closer. Your report is being generated! We're pulling together relevant information and a map for the point of interest. Your report should be ready in just a minute. You can close this dialog whenever you wish, the report will continue to load in the background. When it's ready, you will be prompted or it will be automatically downloaded depending on your web browser. We're very sorry, but it seems that we've had a problem generating your report. Try again and if the problem persists, please let us know at water_inquiry@dnr.in.gov. To begin the eFARA process, you must place a point on the map. You can do this by entering an address or zooming to an area and clicking the map. Hold SHIFT and drag you mouse across the map. This will make the map zoom into the box you draw. Try using your mouse wheel to zoom in and out. Enter your address in the prompt near the top of the page. Jump to your county using the select box at the top of the page. It looks like you might be looking in an area that has no regulated flood hazards identified. This does not mean this area has no flooding or that it is not at risk of flooding. It seems that the Base Flood Points, or Flood Elevation Points, aren't turned on. You can turn them on by clicking the red "Layers" button then clicking the button next to Flood Elevation Points. Or you can just click here now. To determine the closest Base Flood Elevation, please zoom in closer. To zoom, you may double-click a location, use your scroll wheel, or use the zoom-slider on the left of the screen. The data layer "Preliminary Special Flood Hazard Area" ("Preliminary") is a proposed digital product (DFIRM) presented by FEMA for acceptance and approval by the county as an official DFIRM for that particular county. This Preliminary flood hazard information is for outreach, advisory and review purposes only, and is subject to revision. It should not be used for regulation, enforcement, insurance rating purposes, or for mandatory flood insurance purchase requirements. Further information about the Preliminary data can be found at: msc.fema.gov. Along many waterways, an Approximate Flooding Elevation is provided for selected Points of Interest. These elevations are based on Flood Elevation Points (FEPs), which are points placed on the centerline of the stream at 50 feet intervals or within lake boundaries. The FEPs are either determined from the Base Flood Elevation information from FEMA's Flood Insurance Studies, or from studies done by or for the Division of Water. Please note that these elevations are provided for general information purposes only. If a Base Flood Elevation is needed for official flood insurance or construction purposes, the source must be from a FEMA Flood Insurance Study or from a DNR determination. To determine if a Flood Insurance Study exists for your site, double-clicking on the FEP can show you if the Flood_Zone is listed as an AE. 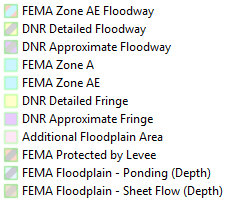 If the Flood_Zone does not state AE Zone, a DNR determination would be needed and can be requested through the eFARA Wizard. Supporting documentation for elevation certificates and letter of map change. Briefly explain the reason why you are requesting floodplain information. Please make sure you've entered information into all the required fields. Please enter your information as the eFARA Requestor. Complete this screen if the Property Owner Information is different from the Requestor Information. Otherwise, skip to the next screen. Please review the information below for accuracy. Click Submit to submit your request for review to the IDNR staff. You will receive a confirmation email. After clicking submit, you will be given the opportunity to submit supporting documentation, such as legal descriptions, surveyor property location survey, subdivision plats, building location plans, construction drawings, site location map, etc. Your eFARA has been submitted. Please wait for an IDNR staff member to contact you with further details. You may attach copies of documents such as legal descriptions, surveyor property location survey, subdivision plats, building location plans, construction drawings, site location map, etc. that will be helpful in completing the floodplain determination more quickly and accurately. Please limit this to five (5) supporting documents. The Indiana Department of Natural Resources, Division of Water, has developed the Indiana Floodplain Information Portal (INFIP), as a tool to disseminate floodplain information for local officials, developers, engineers and the general public. As part of INFIP, the portal features a tool to determine the Base Flood Elevation (BFE) from a point selected on the map. This tool is based on Flood Elevation Points (FEP's), which are points that are placed on the centerline of the stream at an interval of 50 feet. These points are attributed with the Base Flood Elevation, either from a Flood Insurance Study , or from studies done by or for the Division of Water. The application then locates the nearest FEP from the point selected, and provides that elevation as the BFE. In most cases, this methodology works well. However, there are times where the nearest FEP to the point selected is not the most appropriate elevation to select. Following are some examples of where judgement should be used in determining the appropriate BFE to use. The main issue with the determination function within INFIP is how it handles turns and bends in a stream. This example is an extreme case, but with the severe switchback Silver Creek takes in this area, the nearest point is shown as the downstream point (at 463.0) but the upstream point (as shown below) at 463.5 should be used. This example shows how a slight difference in the position of the point click can give different results. In this case, moving the point slightly gives the point to the south (upstream) instead of to the west (downstream). The upstream BFE is the more appropriate elevation determination for this property. Also watch for the effects of a tributary coming into a larger stream. In this case, the appropriate elevation to give would be the main stem elevation to the south, instead of the tributary elevation (even though the tributary elevation reflects backwater from the main stem). Another issue are determinations that are between two streams. In this case the stream to the west is giving a significantly higher BFE (823) than the stream to the east (817). If there is any doubt, absent of other information (such as ground elevations), always use the more conservative (higher) elevation. Also, the Division of Water staff are always available for consultation if it isn't clear on what elevation is best. 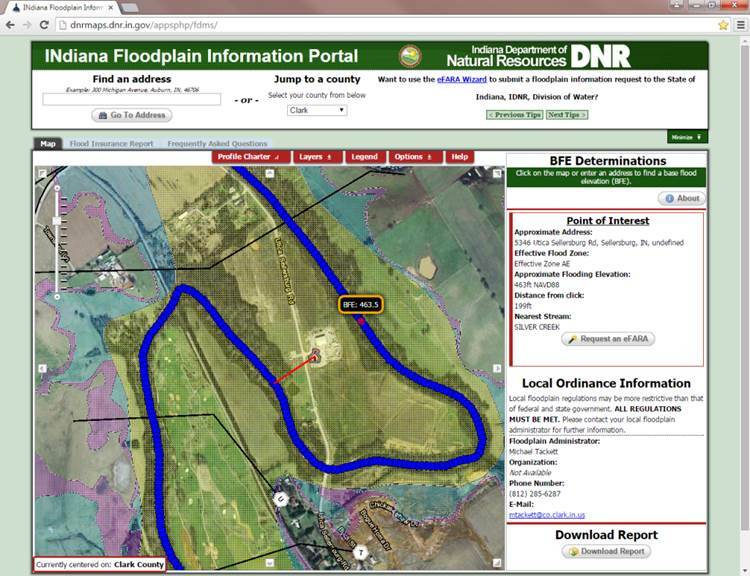 For reporting issues with the Indiana Floodplain Information Portal, or the data displayed, please email water_inquiry@dnr.in.gov, with the subject line "INFIP Issue". Below are a few address alternatives that may better match the address you're looking for. What are Base Flood Elevations (BFEs)? By analyzing various variables using a series of computer models, the height of the floodwater is determined by identifying the ground elevation at a given point where the floodwaters are predicted to reach during a base flood event. These elevations are referred to as the base flood elevations" or "base flood elevations". Once these elevations have been established, flood "plains" or more commonly called flood "zones" can be identified on flood maps. In an effort to minimize flood damage to life and properties, BFEs are used by federal, state, and local agencies to regulate areas subject to flooding. To find out more about floodplains, flood insurance, and state floodplain regulations, click on the FAQ tab. Not available. Please zoom in.